They say that 'the best things come in small packages'...well that must be true in the case of Barbados when it comes to the subject of adventurous, fun activities and general things to do. One of the great strengths of Barbados is that there really is something to please everyone. Thrillseekers...try something you've never done before. Perhaps ziplining over Jack-in-the-box gully or hire a car and by map, discover the rugged North and East Coasts of the island; try kite or windsurfing and be a part of the action at Silver Sands. 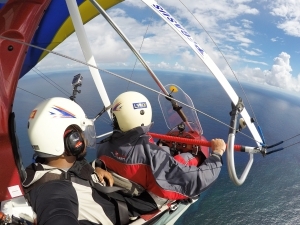 Pilot Paul Nugent offers microlight aerial tours of Barbados bringing together an exhilarating sense of adventure and breathtaking views of the East coast.